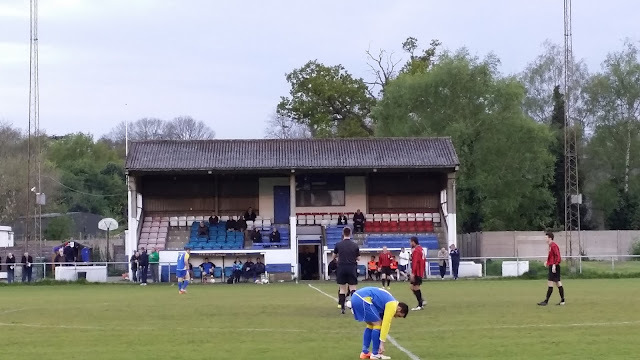 I had been looking to complete the Spartan South Midlands League for some time and with 6 to go after visiting Oxhey Jets on Tuesday, I only had 6 to go after that, and one of the best grounds in the league was Hertford Town. So I was fairly pleased when they had a big fixture backlog due to a badly waterlogged pitch, as it meant I would have more choice of what games to go to. 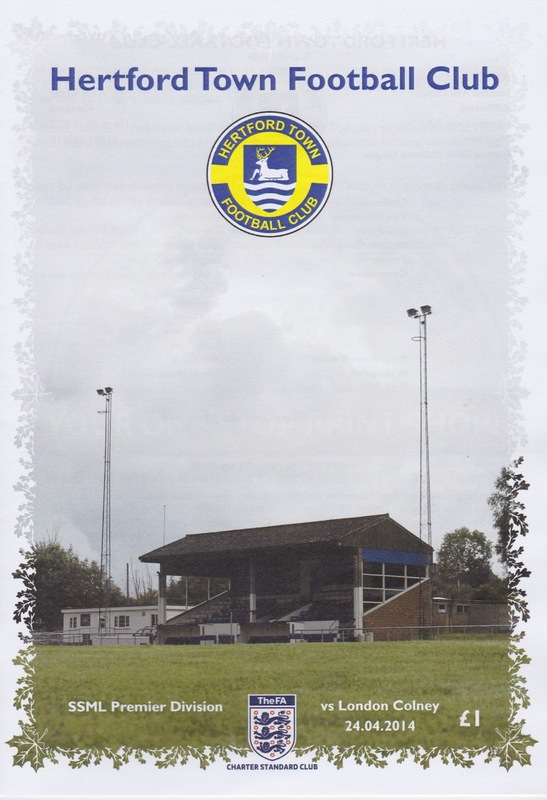 Hertford Town were formed in 1908 and after playing in the Hertfordshire, Athenian and Delphian leagues, they joined the Isthmian League Division 2 in 1973. They were there until 2006 when a 13th out of 16th placing saw them exit Division 2 and join the Spartan South Midlands League. They initially did well, finishing 3rd and 4th in their first 2 seasons, but more moderate placings have followed since. In the FA Cup they got as far as the 4th Qualifying Round in 1973 before losing to Hillingdon Borough. In the FA Vase they have reached the 3rd Round on a few occasions, most recently in 2012 when they lost to Ampthill Town. 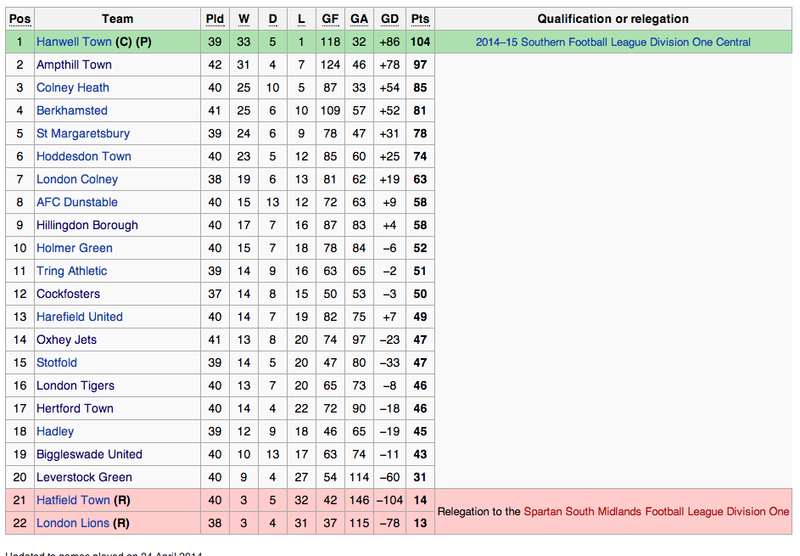 They were a disappointing 17th place in the table, but well clear of relegation. London Colney meanwhile were having a decent season, looking set to finish 7th. 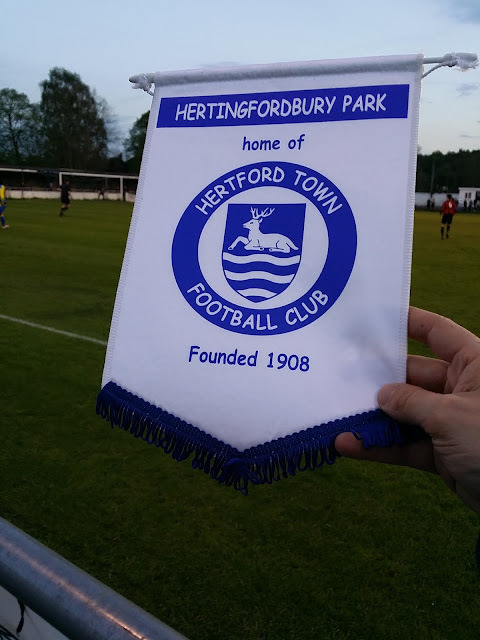 They played in the Hertfordshire League until 1992 when they joined the South Midlands League. This merged with the Spartan League a few years later and the club have spent the majority of their time since in the Premier Division of this league. 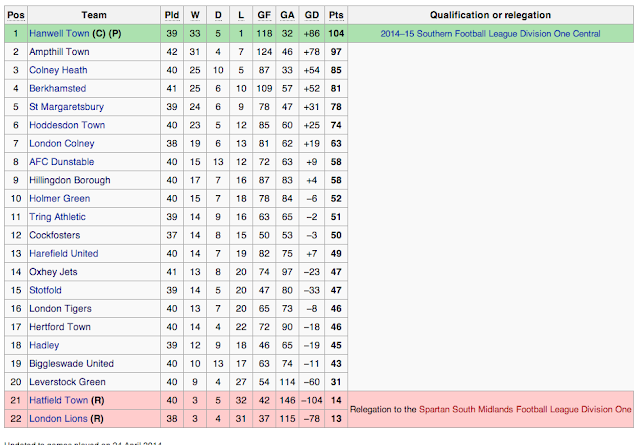 They even won it in 2002 but did not take promotion to the Isthmian Division 1 North. They got to the FA Cup 1st Qualifying Round on a number of occasions and in the FA Vase they got as far as the 4th Round in 2000, before losing a 7 goal thriller to Eccleshill United. I was at work on the day of the game and it had been busy and tiring, with me up at 4 and not finishing till 1.15. I went home and had a bath and didn't have too much time before I had to leave to pick up Anwar. In any case, at least I made a start on my Billingham Town blog, clearing some of the backlog after doing 8 games in 3 days. My Dad rang me to warn me that there was bad traffic in lots of traffic in Hertfordshire, and indeed he was right, as I set off to meet Anwar. I got to Aylesbury at 4.15 and picked up Anwar. As the M25 was shut due to an oil spillage, I had to plan an alternative route and so had to go cross country, passing through the likes of Berkhamsted and St Albans on a horrifically slow and annoying journey. Over 2 hours later we got to the ground at 6.30 and with not s huge amount of time to spare we opted not to go into town but to eat at the local pub, which had been recommended in my Good Beer Guide app. While the cider was unremarkable - Westons and Aspalls that I had both had before, the food was better. 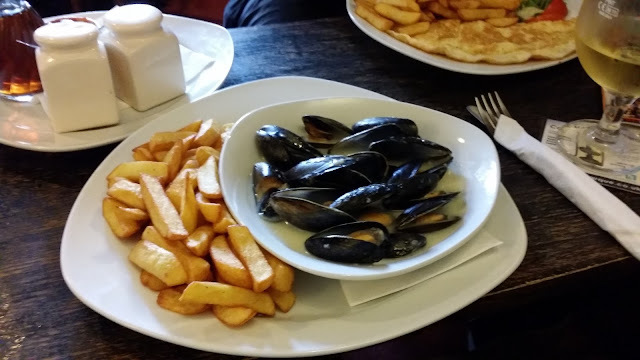 I chose to have Mussels and French Fries, which I enjoyed and had not had since I was in Belgium a few years ago. It was about 7.25 before we were finished, and after getting our things from my car, we made out way into the ground. First stop was a rare thing at this level - a club shop. I eyed up a pennant that I liked the look of and asked the bloke how much. He said 'How Much do you want to pay?' and after putting my hand in my pocket to see what change I had, I pulled out £3. 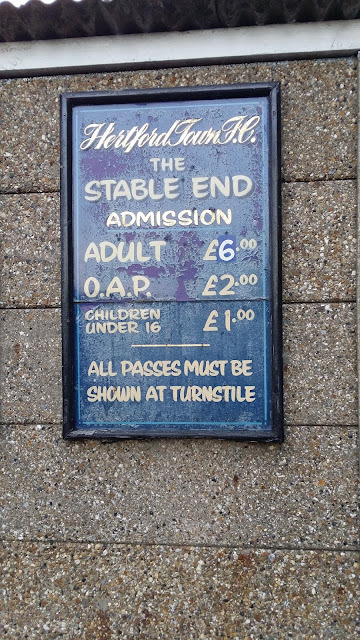 He refused that offer and said it was only £2, which was very nice and the same price as I paid at local rivals Ware, when I visited in 2010. I then took some pictures of the ground, and settled down on the far side, near the halfway line for a decent view of the action. The game was a cracking 4-3 thriller, with the visitors racing into a 2 goal lead early on with a penalty and a goal seconds after where the home defence should have done better. Hertford pulled one back just before half time when a long range shot went through the keeper. That was how it stayed at half time with the visitors lead looking precarious. During the interval I was a bit peckish and so I went to the tea bar to get some chips and a Bovril. While I was there I bumped into someone that looked exactly like my Chesterfield supporting friend Luke. He had seen my Wycombe badge on my coat and it turned out that he lived in Hertford but supported our league rivals Southend. We had a bit of a chat while we waited for our food to cook and he seemed a decent lad, Andrew I think his name was. The second half saw Hertford's fans in great voice, as they had been towards the end of the opening period. Their enthusiasm was rewarded on 53 minutes when the London Colney keeper, who was having a bit of a mare by all accounts, missed the cross and Tommy Wade took advantage, poking in the loose ball. 2 further goals came for Hertford - Tommy Wade again and Leigh Rose giving them the lead. London Colney pulled it back to 4-3 on 89 minutes to make it a tense finish. But Hertford saw the game out to give them 3 points and they looked good, despite having a backlog of games. It had been a really decent contest and an enjoyable evening. The journey home was a lot easier, despite a 10 minute delay early on, due to a broken vehicle at a roundabout. In any case, I dropped Anwar back home and was home myself around 11PM. I was tired though after doing lots in the past week. That meant that my planned trip to Suffolk for a game on the Friday went by the wayside, meaning that Wycombe's game at home to Bristol Rovers would be my 123rd, breaking last seasons record with plenty of time to spare. HERTINGFORDBURY PARK is a very good venue for this level. There is an old seated stand, probably holding around 300 which is very similar in style to the one at Windsor. The only other covered area in the ground is my favourite part of the ground - a terrace that runs the whole length of behind the goal. The rest of the ground is open, with some steps of terracing, though the long grass on the far side lets it down a bit. The club shop is one of the best at this level, offering a decent range, and a few old books and programmes too. The tea bar is also good, with a decent choice at reasonable prices. The chips and Bovril were good too. As for the bar, I didn't try it, but there is a decent pub nearby called the Black Horse, which also does nice meals.